When it comes to designing your kitchen’s layout, it can be difficult to know just what you’re looking for. Rather than guessing and trying to bring in a variety of ideas, look over the following layouts to decide which style may be right for your circumstances. By approaching the layout process in this way, your kitchen will flow seamlessly and be both functional and comfortable while displaying your own personal sense of style. When it comes to building a home or remodeling, there are many factors to consider. 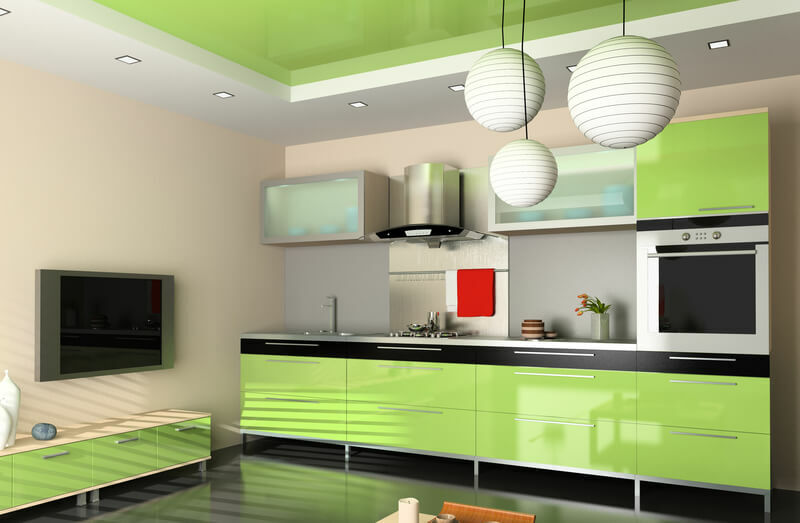 The type of appliances you have and how many can depend on what shape of kitchen you may wish to pursue. Many homes have straight or kitchens. Although this may seem practical, that does not mean that it is any more efficient. Straight line kitchens tend to take up more space in the home. While square shaped gives you less room to move about in the kitchen.One of the most appealing and efficient kitchens are the G-shaped kitchens. This will allow you more room to move around and are typically much more appealing to the eye. Usually, a G-shaped kitchen will consider of an island that will become very handy while preparing meals and serving. The other setup using two walls is the “L” design, where perpendicular walls are used for placing all kitchen implements. This is a great setup for those who like to entertain and share cooking experiences, as it allows room for multiple people to work and can include a table for dining as well. 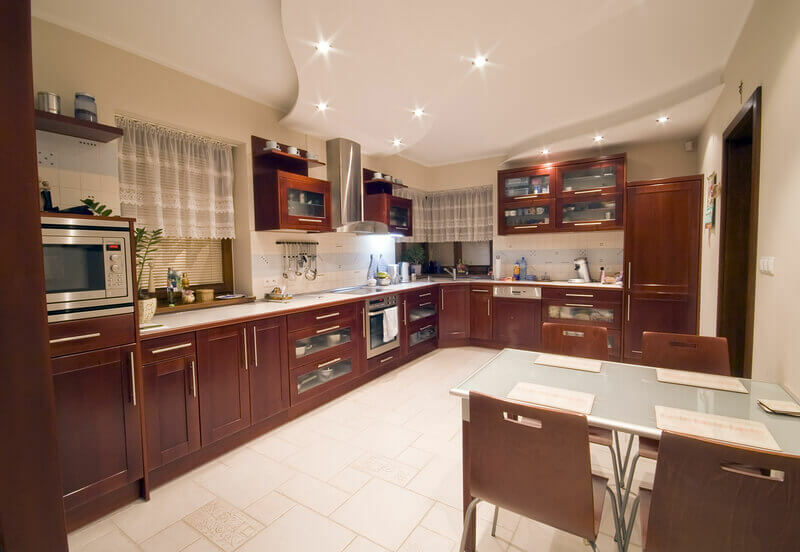 This setup can work in kitchens of varying size, as appliances and cabinets can be situated to fit the available walls.In an L-shaped kitchen, two of the four walls of the kitchen have counter tops, cabinets and appliances. The stove, oven and range hood or microwave typically share one wall, while the sink and dishwasher share another. The refrigerator usually goes where it is most convenient. By adding an extra peninsula to the end of an “L” design, you can create a kitchen with extra area when space is too limited to allow for an island addition. It makes for a nice little eat-in area and doesn’t close off the kitchen from the rest of the home. L-shaped kitchens are the most popular kitchen layout and also have ergonomic research behind them. 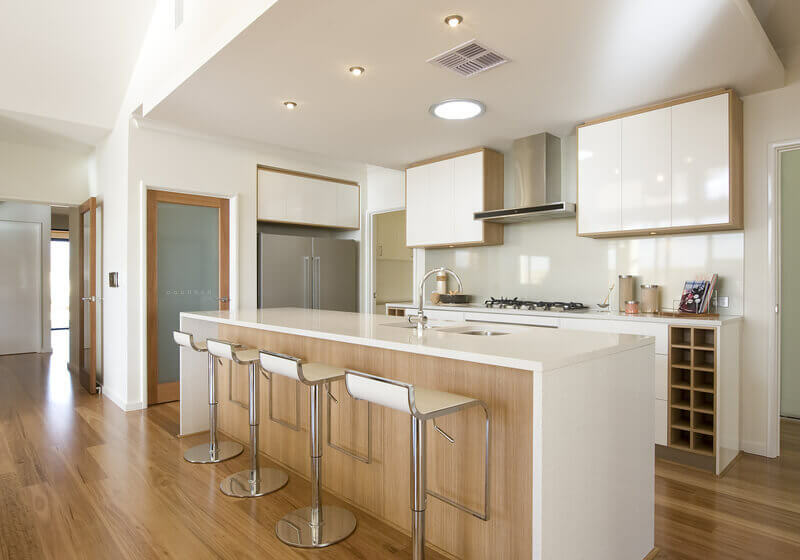 Among the advantages of L-shaped kitchens are that they work well for small kitchens and also leave room for dining tables or kitchen islands. The classic new U shape kitchen is designed to accommodate one or more chefs. The design is actually shaped like a horse shoe. The counters, cabinets,and appliances are lined up evenly and securely around the wall. Although the U shape kitchen is narrow in width and length, the U shape kitchen provide efficiency, for full range maneuvering. Kitchens with a “U” setup are efficient if you generally cook alone, as they keep things within reach and confined to one side. It may be a good choice for those with limited space or those who prefer to maintain a separate dining area, as it doesn’t allow for a table and chairs. If it’s roomy, you can add an island for extra work space.A wide U shape design reduce the amount of efficiency, due to the fact that too much space, places the appliances in the kitchen too far away. The idea of the U shape kitchen design is to provide chefs with a triangle layout of a well-organized kitchen. 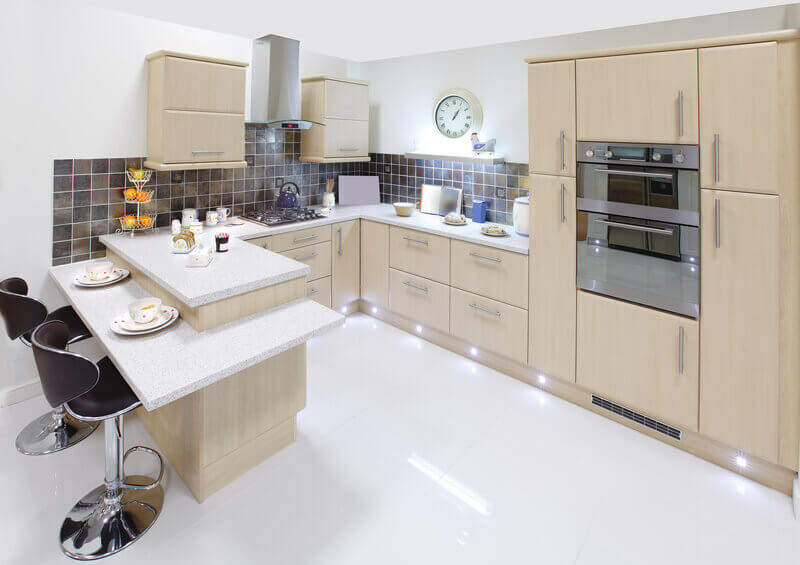 A galley kitchen is a kitchen with two walls that run with each other, allowing for more room in a confined space. A galley kitchen is great for small areas with little space or even for a large kitchen giving an open feeling. The appliances often run on one wall and cabinets on the other.The galley kitchen layout can be very budget friendly. This setup is one of the most convenient available and works well for homes that have a little more kitchen space to work with but aren’t spacious. The galley design features two walls opposite each other, holding appliances, cooking space, sink, refrigerator and cabinets in two long rows, making cooking and clean-up quick and easy. If you do a lot of cooking and are limited space-wise, this may be a good option. A benefit of this type of kitchen is that you don’t have to move around much to get your work done. These kitchens help increase storage by working vertically. 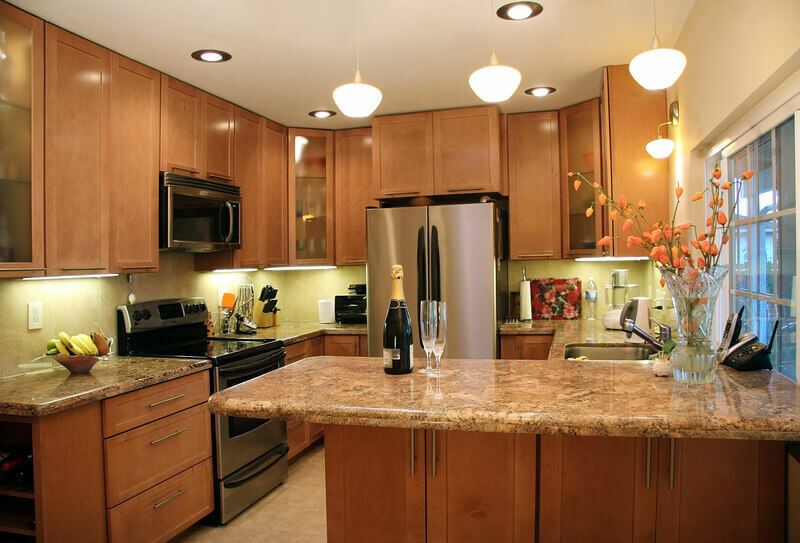 A galley kitchen is perfect for a condo or smaller homes. Single wall kitchens are just as they sound. Everything in your kitchen is lined against one wall, the stove, sink, cabinets and refrigerator. Most of the time the sink and stove is found in the center with the refrigerator at one end and dishwasher on the other. With everything lined up against one single wall it allows for more room for items such as a small table to eat at. A one-wall kitchen layout is good if you have a small area. It takes one wall and designates it for all of your components including the sink, refrigerator, cooking implements and stove. This keeps everything easily accessible in one area. You may be able to utilize cabinets, sliding storage or small doors to hide any visible items and reduce the appearance of clutter. Appliances are usually set up in a way that’s convenient, such as around the sink, in order to make cooking and cleaning up as efficient as possible. If the area is especially small, you may consider apartment-sized appliances or using your table as an additional work space.This style kitchen is perfect for smaller areas. Though everything is against a single wall these kitchens can be very stylish for any size house giving and open airy feeling. All of these setups have pros and cons, so ultimately your kitchen layout will be based on your preference, your budget and the amount of space you have to work with.